Too much time spent under the summer sun can be dangerous for children. Skin that is not properly protected can result in sunburns. Frequent overexposure to the sun can cause long-term damage to the skin. According to the Canadian Cancer Society  (CCS), sunburns in children may increase the risk of developing skin cancer later in life. Sunburns can occur from the direct rays of the sun, as well as from tanning beds or sun lamps. 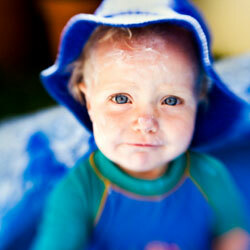 For children under 6 months of age, exposure to the sun and the use of sunscreen are not recommended. Infants should be protected from direct sunlight. If this is not possible, then discuss the use of sunscreen with your physician. Children over 6 months of age should be kept out of the sun or have limited exposure to the sun and should wear sunscreen. According to the CCS, it is recommended to avoid being in the sun between 11 a.m. and 4 p.m.
Sunscreens with a minimum SPF of 30 that protect against both UVA and UVB are recommended for children. Sunscreen should be applied to all areas that are exposed to the sun, especially ears, nose, back of neck and legs, and tops of feet. Apply sunscreen 45 minutes before going outside and reapply frequently. Make sure to reapply after swimming or playing in the water. Children should wear hats and bright, loose, cotton clothing when in the sun. Children should wear sunglasses with UVA and UVB protection. Avoid looking directly at the sun. First-degree sunburn symptoms include redness, sensitivity, and pain. It is usually uncomfortable for 24 to 48 hours. If you have sunburn, stay out of the sun until your skin recovers. Second-degree sunburns can be caused by longer exposure that may result in swelling and blistering. Second-degree sunburn requires medical attention.